This Program allows you to navigate your game by using your own body as a joystick. You can move your body to the left and right to turn in those directions. And to the front and back to go forwards or backwards. 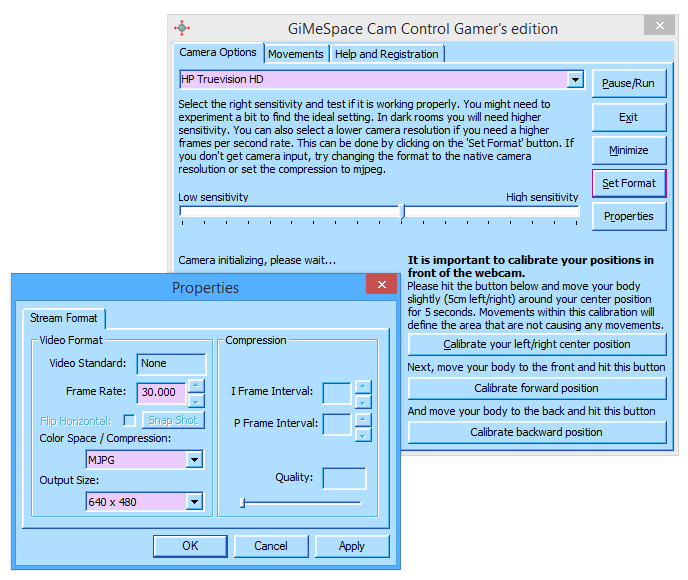 There are many options to calibrate the camera input to optimize the precision of the camera input. Keyboard, Joystick and Mouse input can be emulated depending on what your game needs. This program is developed to have minimum impact on your cpu usage so your games performance is not going down. Ever thought of controlling the speed of game so that you can have more reaction time, or more powerful gun fire, or run faster in the game? Asoftech Speeder is such a tool to adjust the speed of Windows games and applications. It can speed up the games so that your gun fires faster, or slow down games so that you can have more time to react. Asoftech Speeder uses a revolutional speed modification technology, which does not need any hardware change, you do not need to spend a single $ on hardware. Asoftech Speeder does not change any hardware configuration, it does not overload your computer, so there is no harm to your hardware at all. Asoftech Speeder does not depend on any hardware, it changes the speed of games through our software only. Key Features – Adjust the speed of Windows games and online games. – Control application speed and Windows speed. – Easy to use, to adjust speed, just drag the slide bar or press hot keys. – Speed up to 256 times, or slow down to 1/256 times. – Hot key enables speed change anywhere, any time. Asoftech Speeder gives you totally new game playing experience. Asoftech Speeder can speed up the games or Windows applications to be up to 256 times faster. It may also slow down your game to be 256 times slower so that you can have a better control of the game. For example, you can slow down the action games so that you can see the bullet’s flight track and avoid it easily. Asoftech Speeder is very easy to use. All you need to do is set the speed through a slider bar, and click on Apply button. You can also press an easy accessible hotkey to speed up game, slow down game or adjust game to the speed you feel most comfortable with, any time you like. Asoftech Speeder allow you to change the speed of game in real time. You can press a key to speed up the game when you want the game to run faster, and press a key to slow down the game when you want it to run slower so that you can control it better. :: Complete level control :: Everybody’s favorite retro Mac arcade game now has an editor that easily lets you create, edit, and install levels to make them as simple or challenging as desired Download the editor that puts the firepower in your fist. December 14, 2014 Games, Software, Tools & EditorsLastEnd Entertainment L.L.C. LastEnd Visual RPG Studio (VRS) gives you the power to create your own game without any special knowledge or training. All you need is a computer an a imagination, and your on the way to making your own game. This 2D / 3D game engine and editor for Windows can support many types of games not just RPG (Role Playing Games); because of its open project template system. As an important link between windows system and multimedia operational and display, DirectX has been an epoch-making technique to serve complex applications especially games. DirectX errors occur from time to time and impact the functioning of games drastically, causing a nightmare to gamers. Cheer up now! With a revolutionary DirectX management tool, you can always find a solution whether your game won’t run, the DirectX update goes wrong or your DirectX needs a backward. Reinstall DirectX is such a tool to wisely integrates DirectX diag feature from windows system, helps update DirectX from official Microsoft websites, repair DirectX errors, back up and restore DirectX and achieve DirectX rollback simply with a system setup disk. Unlike the traditional way to reinstall DirectX by reinstalling the whole system from scratch, DirectX rollback realized with this tool intelligently replace only the DirectX files with the target database and leave the rest system files intact. In this way, users can save considerable amount of time needed in other common software installation after a brand-new system reborn. Also in some cases, you need to either update DirectX to a higher version or revert to original lower version to meet the recommended requirements of your fancy games. Reinstall DirectX is second to none in completing these tasks too. It automatically scans your DirectX version and offers official update links to upgrade securely. Also, with a backup file of the original DirectX or a system setup disc, you can either restore DirectX or reinstall DirectX in only a few minutes. It’s worth mentioning that you need to cut off all net connections when you disc-basely rollback DirectX. With Reinstall DirectX, no DirectX error will be able to stand in between you and an amazing game. There’s always a solution to solve your DirectX problems. Use Reinstall DirectX, the only DX management tool so far, wisely, your game play experience will be expanded and boosted! Copy Game CD, Copy Video CD, Copy Data CD, Copy Music CD, Copy Audio CD, Copy VCD, SVCD, and so on. Game Copier is designed for copying your CDs including game CD, VCD, Audio CD, data CD, music CD, video CD, Super Video CD, and so on. It can copy CD to CD on-the-fly, or rip your CD to an ISO image file saving to your harddisk for future burning. And it can burn an ISO image file to an empty CD disc. Retailers, supermarkets, stores, malls, trade shows, parties and games are a perfect place to use a prize picture. With the fun environment it brings to the event, it is a sure way to keep the atmosphere fun and exciting. You can add up to 100 prizes with different pictures to the project, all prize pictures roll very fast in the same area after running the prize picture project, a prize picture will stay for a time when press Space or Enter key. Features: * There can be up to 100 prizes in a prize picture project, every prize can be set a picture. * Set prize quantity, limit prize quantity to a quota. * Support roll sound and back music. * Support transition effects after a prize is drawn. * Support to zoom in prize picture after it is drawn. * Support to add back picture and back video to prize grid project. * View statistics and detail records. * Support to export statistics and detail records to Excel file, text file and html file. * Security password can be set to prevent unauthorized users from seeing prize setting, records. 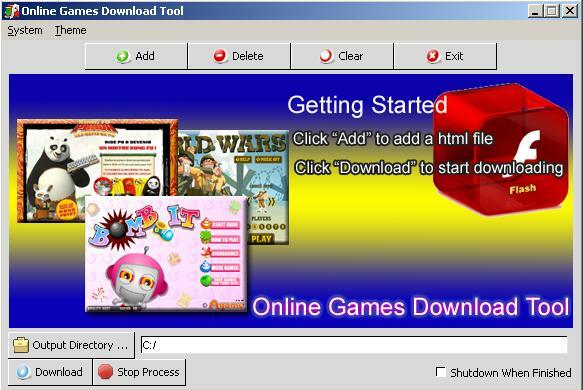 Online Games Download Tool is a desktop application that catches web links including flash games from your clipboard or you enter and batch download them. Start it up, copy the web URL and click download. It can automatically detects the swf files. Flash Games Download Tool Key Features * Save flash animations in web page in a fast & convenient way. * Resume failed downloads. * Detect Flash files from an URL; * Search in local cache files; etc. * Powerful & convenient management of downloaded Flash files. * “Copy URL” function (hot key: Ctrl+C): can copy detected flash item’s URL to clipboard. * Friendly hint Window. Flash Saver’s hints are shown in a friendly way like MSN. It won’t break your current operation. * Downloading in batches, download multiple files at one time. Flash Game Download allows you to load all game files you want to download, then click “Download” button to download them… * Easy to use – Just two clicks, everyone can become the master of Flash Game Download. * Automatically shutdown the computer after downloading. * High speed – 400% fast than normal download. Create HTML Help(.chm), Web-based Help and PDF with Microsoft Word. 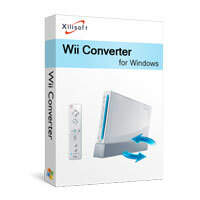 XiliSoft Wii Converter, an amazing converting tool which can turn your Nintendo Wii to a convenient multi-media player. XiliSoft Wii Converter is capable of converting nearly all popular video and audio formats like AVI, MPEG, WMV, MOV, MP4, RM, RMVB, DivX, ASF, VOB, 3GP , MP3, WMA, AAC, WAV, CDA, OGG, FLAC, APE, to Wii supported formats Wii-AVI，Wii-MOV, MP3, WAV and transfer them to Wii efficiently. 1.Convert AVI, MPEG, WMV, MP4, FLV, MKV, H.264/MPEG-4, DivX, XviD, MOV, RM, RMVB, M4V, VOB, ASF, 3GP, 3G2, SWF, H.261, H.264, DV, DIF, MJPG, MJPEG, DVR-MS, NUT, QT, YUV, DAT, MPV, NSV, H.264/MPEG-4 AVC (*.mp4) files and etc to Wii supported video formats Wii-AVI or Wii-MOV. 2.Convert WAV, WMA, AAC, AC3, AIFF, AIF, CDA, FLAC, MPA, M4A files and etc to Wii supported audio formats MP3 or WAV. 3.Transfer all the converted files into Wii quickly. 4.More than one output format can be converted just from one source to meet different requirements. 5.You can split the video/audio source files by size or duration time to your preference. 6.Preview videos with the aspect ratio of 4:3 or 16:9 in a built-in player. You can take snaps anytime during preview. 7.You are able to set parameters such as size, quality, bit rate, frame rate, sample rates, channels, volume and etc to customize the output effect. 8.Several tasks can be processed at the mean time according to your demand. 9.Prevent standby/hibernation when connecting to mains or using battery. 10.Background running in different priority to balance your CPU usage. 11.Auto-exit the application, shut down, hibernate, stand by system, or do nothing which keeps you from waiting all the time. 12.English, German, Spanish, French, Japanese, Simplified Chinese and Traditional Chinese interface languages are available.